A new season in Fortnite means a whole bunch of challenges that unlock over the next few weeks. The first week has us seeking out the brand new pirate camps. These swashbucklers have gone out hunting for treasure and set up their bases of operations in seven locations in total. You’ll need to visit them all to complete the challenge, but you can always loot any plunder you find and have a bit of fun with the cannons inside each of them. Tthis guide will go over all of the pirate camp locations needing visiting to complete Week 1’s challenge. With the game being the global sensation that it is, there’s a lot to learn about not only getting that all-important “Victory Royale”, but also the changes to the map as the seasons progress, and the challenges you can seek to complete. Head over to our Fortnite guide hub for every single thing you need to get started. Alternatively, you can head back to our Fortnite week 8 challenges guide for an overview of all the weekly challenges for this Season in Fortnite. Please click the image for an full-sized view. Above is the map showing the locations for all the pirate camps. You need to visit all seven of them to complete the challenge and we’ll be going into more detail on each one’s location below. Each one contains a bunch of cannons that you can fire yourself or cannonballs out of. This can be useful for traversing long distances, provided you have the gliders on you of course. The towers also contain plenty of chests and other valuable loot, so are worth plundering before moving on. The first one is on the mound to the north-west of Fatal Fields. It’s close to the snow biome border and shouldn’t be too hard to spot, though it does also have a rather commanding view of the local area. You can use the cannons to cover a lot of ground from this pirate camp. On the western-side of the river north of the new area Lazy Lagoon, which replaces Lazy Links, there’s a pirate camp just up the hill. It’s also not too far east of the new Block area location on the map. It also has a good view of the local area, particularly of the ship and small town next to Lazy Lagoon. Towards the south-east of Loot Lake are two large mountainous areas. The eastern-most one has a pirate camp situated just slightly north of it. Towards the border of the grassy biome and desert biome, there is a pirate camp. It’s to the north-west of Paradise Palms and it also has a girder bridge leading from it. South-west of Pleasant Park, there used to be an abandoned house that was home to a small amount of loot. It has a small path leading from it that is visible from the map and is sandwiched between the two mountains to the west of Pleasant Park. This is now replaced with a pirate camp, which is honestly a bit of an upgrade. Close to the frozen lake to the west of Shifty Shafts, there’s a small valley that will lead up to the north-west. Reaching the top of the slope, you should be able to see the pirate camp. In the new volcano area, where Wailing Woods used to be, there’s a pirate camp partway up the mountain. It’s to the western side of the lava lake oozing out from the bottom of the volcano. This concludes our pirate camp guide, but there’s plenty more challenges to complete in Season 8. 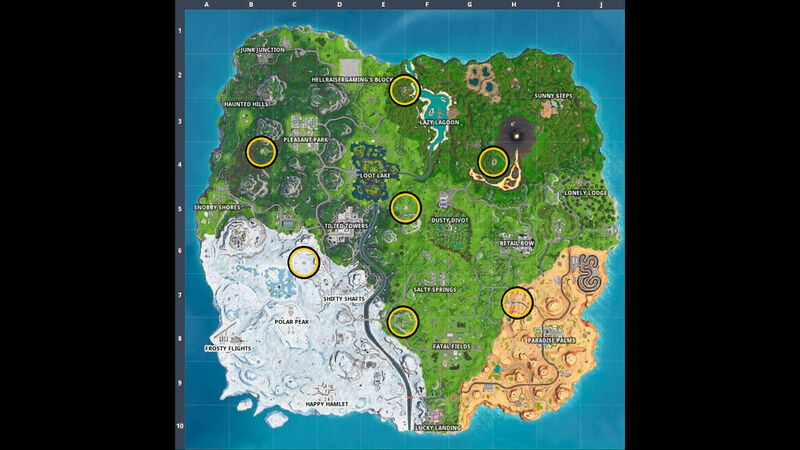 You can find out where to find the volcano vents in our Fortnite Volcano Vents locations guide, while you can also visit the Giant Faces in their respective mountain tops by going to the locations highlighted in our Fortnite Giant Face locations guide.